Together with Francis Bacon and Lucian Freud, Frank Auerbach is a leading figure in British art and recognized internationally as a post world war modern master. 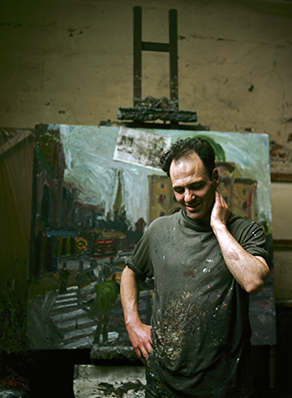 Frank Auerbach has become a symbol of “Englishness,” heralded as a British icon. Identified with the Neo-Expressionist current, Auerbach had been well established long before the movement began to attract international attention. He carries expressionist techniques to extreme lengths, creating a style incredibly innovative and distinct. Like Freud, Auerbach is of German Jewish origin. Born in Berlin in 1931, he arrived in Britain as a refugee in 1939. His parents perished in the Holocaust. Early in his career Auerbach came into contact with David Bomberg, one of the leading members of the Vorticist Group prior to the First World War. Auerbach inherited from his tutor a pictorial language mainly concerned with tangible surface and intense identification with the object viewed. Dramatically influenced by Bomberg, Auerbach chose to devote himself to art and studied at St. Martin’s School of Art and at the Royal College of Art in London where he graduated A.R.C.A. 1st Class Honors, Silver Medal. Auerbach has cut a niche for himself in art history through his unrivalled use of pigment. His distinctive, viscous impasto surface takes on form, approaching relief. The layers of paint are built up in a repetitive process involving painting, scraping, and repainting. The thickness of his paint, however, does not overburden the sensitivity of his contemplations or his dynamic relationships with his subjects. A variety of moods arise from each work through the combination of delicate tone and color, and strongly masculine line.